The launch of the Samsung INNOV8 showed the Koreans know how to put together a top-end handset to compete with the best. But it has also shown it can create a decent range of phones as well, with the unveiling of the i740. Designed for the mid to low end of the business market, this Windows Mobile handset only works on GSM and EDGE networks, and dispenses with the battery-eating WiFi. You might wonder on the point of this device; however functionality isn't always everything, even in the business world. 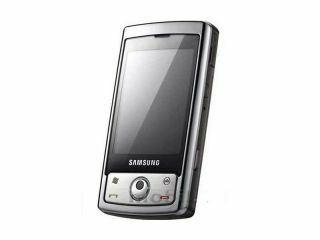 Many only want a nice-looking handset that can handle basic email, calling and calendar functions, with a camera for the odd photo, which this has by including a 3.2MP snapper on the back. The i740 (which really should get a funky name like its bigger brother; Techradar suggests the TRIANGUL8 as it's random enough to fit in with the bizarre INNOV8 moniker choice, but hintsthe phone has a GPS chip...which it does). The handset also feature the innovative optical mouse, so if you really are into web browsing over slower networks, or want easier file management, this should be a breeze. Available for around €300 (£237), get your hands on one around October time.